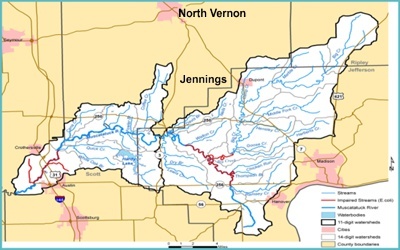 At the very southern end of Jennings County, a small area of the Central Muscatatuck Watershed, there is a voluntary Cost Share Program that is intended to provide landowners with financial and technical assistance to install conservation practices. The Cost Share Program will pay up to 60% of the total cost with a $25,000 cap per participant. Reimbursement will follow the installation and approval of the project(s) that landowners install. Conservation Practices are required to meet Natural Resources Conservation Service design specifications and installation recommendations and must have a conservation plan developed for their operation. Cost share practices include fencing, alternative water systems (pipelines, spring developments, tanks, pumps, etc. ), Heavy Use Areas, pasture and hayland seeding, steam crossings, roof runoff and more.